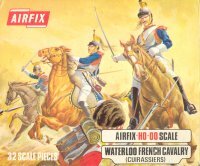 When Airfix decided to make some Waterloo figures, it seems only natural that they should include French cuirassiers in the first batch. The very epitome of French heavy cavalry, there were over 4,000 of them on the battlefield, more than a quarter of the total French cavalry. Anyone who has ever tried to assemble Airfix cavalry will know that this is a Herculean task that does not produce a particularly satisfying result. Why no one at Airfix thought of moulding horse and base as one is a mystery - today it seems obvious. What it means is that several hooves must be touching the ground to make the horse stable (which limits available poses) and that pegs on the hooves must fit into holes in the very thin base. Since the pegs themselves were thin, and the holes seem to grow as this mould is used more and more, the at best precarious fit is frequently no use at all. Equally, the men do not fit the horses well, perched as they are on the horse's back. Any slight movement or draught will cause them to lean forward or fall off, so glue is always required. The whole thing is very fragile, and is likely to drive customers to seek alternatives, particularly for the horses. The figures themselves are quite poorly defined and lack the crispness of other sets Airfix were producing at around the same time. They have been stripped of as much detail as possible, having no straps or plumes, and the horsehair mane is not well done even on figures that are sideways to the mould (which should make the sculptor's task easier). Not a man has a scabbard for his sword (except the one on foot), and no firearms are present. They have been over-simplified to make the sculptor's task easier (and production costs lower), and they suffer heavily as a result. At an average height of around 1.66 metres all these men are well below the supposed minimum height for acceptance as a cuirassier, which was 1.73 metres. The horses too are simplified, with a basic saddle and cloth that does not even resemble the cuirassier horse furniture. The ears of the poor animals have been moved down the head for ease of sculpting, and no reins have been provided, though there is a strap running from the top of the bridle to the saddle, which is probably meant to be a rein but simply looks ludicrous. Adding insult to injury, most of the horses have circular mould marks, though these are not as intrusive as in some other sets. The poses themselves are not bad, and we particularly liked both the man squatting beside his downed mount and the trooper leading his horse on foot. This last is easily the best part in the set, both in terms of detail and originality. One of the mounted men is carrying an eagle, though no flag is attached. This was not uncommon as flags were easily damaged in battle, but a paper guidon could be attached if required. This is a very old set, and at the time it had no real rivals, so there was no incentive to make a particularly good job of it. Today there are plenty of rivals, so this set should either be completely reworked or quietly retired.